Scaffolding has been put up and the North wall tented for protection. 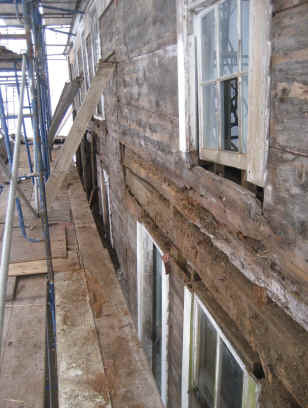 The clapboards and 20th century windows on the North wall have been removed. Some sheathing has been removed for better access to the framing. Some of the sheathing needs repair, some needs replacement. 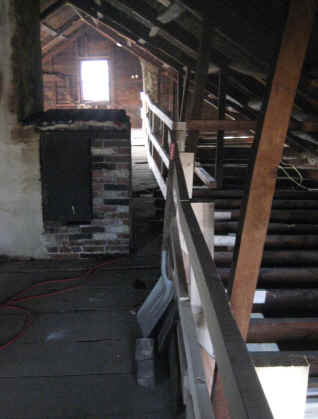 We have found about 90% of the beams need repair or replacement on the North wall. The scaffolding gives both access to all the rear wall and acts as a support for the rear wall. Rear kitchen back door area after sheathing removal showing rotten floor, joists, and no sill remaining. Dan and Chad removing rear wall sheathing. 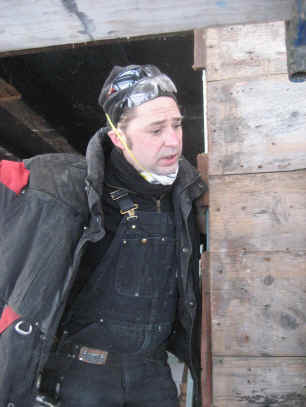 Cary coming up for air during 20th century plaster removal needed to gain access for beam repair. The kitchen with the rear wall sheathing removed. The "cheese room" floor next to the covered stairs. cheese room and the kitchen. Dan hewing middle plate beam. Much easier with the white pine than the white oak used for the sills. Plate and post damage found beneath the sheathing on the rear wall second floor. 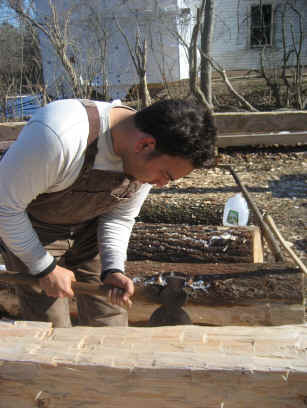 Joe, Chad, and Dan hand hewing the white pine plate. Note part of the joined sill in the background. Inside of second floor rear room. 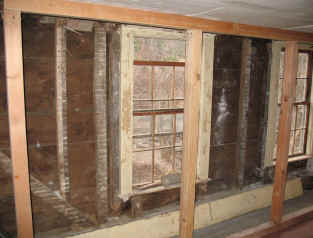 Shows internal bracing, sheathing, and 20th century windows. Rear of kitchen showing missing sill and floor. Safety rail put up in attic. Rear wall is to the right.